After 21 years at Kentucky Country Day School, I'm sad to announce that I will be leaving at the end of the 2014-2015 school year. I started Stitch for a Cause in 2002 with a small handful of parent and staff volunteers and an excited group of student knitters. It has grown over the years into an important part of our school community and my life. I do not know if Stitch for a Cause will continue at KCD but certainly hope my students continue to find ways to impact the community through their handwork. I will be moving on to a new school in Boston, Massachusetts in the fall and am excited about perhaps restarting the group there. In the meanwhile, I want to thank everyone that has helped us and contributed to the causes we support. We are always amazed by the generosity out there and the time and talent of those making warm things for those in need. Please do not send any materials or finished items to KCD any longer, but I encourage you to seek out those places in need in your local communities. Shelters, hospitals, churches, and many other agencies and organizations would value such contributions. Again, thank you for the many, many years of support for Stitch for a Cause. We've had a busy year, but from the long silence on the blog, one would never know it! This year we have an active group of about 15 students that meet on Thursdays during our Utility period and after school. Students started off the year working on an 8 inch square and progressed to an easy baby hat pattern on circular needles. Right now we have begun a sewing project for the Kentucky Humane Society. Students are working in pairs to make cat and dog beds using fleece and fabric. We hope to have 5 or 6 beds ready to donate by the end of May. A special project I took part in along with one of my students was the 600 Monsters Strong group on Ravelry. The group was formed shortly after the tragedy at Sandy Hook Elementary School and put the call out for knitters to make cuddly monster toys to donate first to children at the school but has now stretched to focus on all children affected by gun violence. I knit one monster using the pattern Penelope the Empathic Monster and am also working on another monster using the free Gotta Love Me Monster pattern on Ravelry. One of my students who has done some knitting before this year and is more advanced asked if she could try to make one too, and she did! I think she did an amazing job for a 5th grader. Welcome to our new site! I've been working over the past several months to update the site and make it easier to post updates on our current projects. I've combined the content of our old site with a blog and moved the old posts from Blogger here (very time-consuming!). I hope you enjoy the new look and layout. Over the summer we will be adding more content and begin the process of updating the links on the Resources page. Thank you to everyone who has supported us over the past 8 years and we look forward to many more years of service! Today, Stitch for a Cause members returned to Louisville from Washington DC where they spent the past two days advocating for legislation to improve the lives of newborns around the world. The group included seventh grader Ayesha Singh, fifth graders Sanjana Rane, Divija Sharma, and Sonia Gadre, and KCD teachers Lisa Stringfellow and Marjorie Seely. The group spoke to staff members of Senator Jim Bunning, Senator Mitch McConnell and Representative Ben Chandler and actually had an extended discussion with Representative John Yarmuth of Louisville. Representative Yarmuth was very impressed by the students and agreed to sign-on as a co-sponsor for House Bill 1410, The Newborn, Child, and Mother Survival Act of 2009. 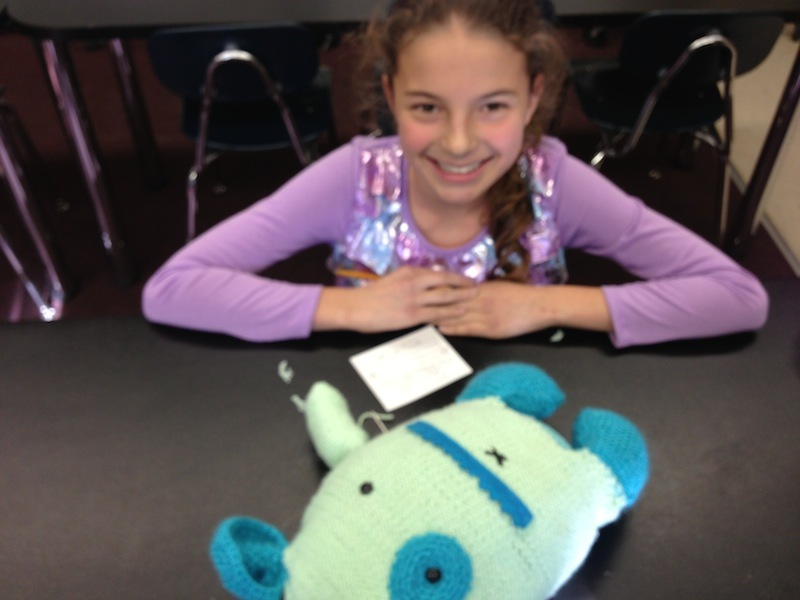 The students shared their work on the Knit One, Save One campaign and about the tremendous community interest and support that has been generated by their effort to save newborn lives in developing countries. The KCD group was one of only four Advocacy Day teams to win the commitment of their member of Congress (out of 125 meetings on Wednesday). The KCD students learned first hand about how our government works and had an opportunity to take part in that process by discussing an issue on which they have worked hard to make a difference. Below are a few more video journal segments of their DC experience. Sanjana Rane and Sonia Gadre discuss their meeting with Senator Mitch McConnell's staff. KCD teacher Marjorie Seely, Sonia Gadre (5th grade), Sanjana Rane (5th grade), Ayesha Singh (7th grade), Divija Sharma (5th grade), and KCD teacher Lisa Stringfellow in front of the White House. Ayesha is holding a scrapbook of pictures and letters from hundreds of knitters that will be presented to President Obama. We have had an excellent visit in Washington so far. We made it to the Eisenhower Executive Office Building on time for our rendezvous with Save the Children organizers and took pictures in front of the White House. A camera crew from WHAS11 met with the our students and interviewed them about their participation in the Knit One, Save One campaign. We were invited to a White House briefing and listened to top-level Obama administration officials for domestic and international policy talk about the commitment that has been made to maternal and child health initiatives and praise us all for our passionate and willingness to voice our support for this issue. Later, at a reception for participants, KCD students were able to meet ABC News Political Commentator Cokie Roberts. Ms. Roberts presented two awards during the evening to Senator Susan Collins and Congresswoman Betty McCollum for their work on behalf of newborn and maternal health initatives. Stitch for a Cause is featured on Save the Children's website! Check out the feature on Ayesha here! Several students and teachers from our school will be heading to Washington, DC on April 21st and 22nd for Save the Children's Advocacy Day 2009. We will be talking to legislators about the Knit One, Save One campaign and advocating for continued support of low-cost interventions to save newborn lives. It should be a very exciting and educational trip for our students! Our Stitch-In on December 13th was a very nice event. Thanks for everyone who came out and those that couldn't that have been sending in hats. Keep them coming! We plan to mail our collection the day after MLK Day (January 20th). If you can get them to KCD or Sophie's Fine Yarn Shoppe between now and then, that would be wonderful! Several local television stations came out to cover the event and Rep. John Yarmuth very kindly came out to lend his support to the efforts of all the knitters. We are still counting hats, but as of that day we had 417 hats done. I have many more now and will post an updated count soon! One of the hats I made for the 2006 campaign that made it to Bangladesh. We are off and knitting for the Knit One, Save One campaign this year for Save the Children. In 2006, we were able to send over 200 caps to the Caps to the Capital project and our goal this year is to reach 500! Save the Children estimates over 4 million babies in developing countries die each year, with more than 1/2 during the first 24 hours of life, from PREVENTABLE causes. Hypothermia is one of the main causes and having a simple knit cap on their head is estimated to reduce the death rate by 60%. Right now students in all three divisions at our school are busy working on this project. 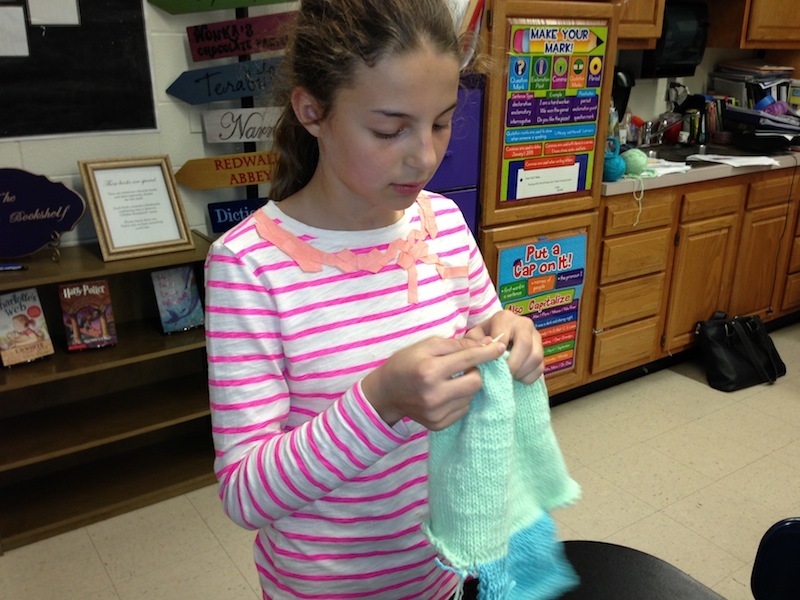 Mrs. Johnson's third grade class already has one hat finished and the middle schoolers are busy as well. Upper school students will begin working on that this week and will learn more about the reasons for the project during an upcoming X-Period. On Saturday, December 13th from 10 am to 2 pm, Stitch for a Cause will host a "Stitch-In" to make hats for this project. This event is open to knitters and crocheters across the Louisville area. More details on this event will be forthcoming. Also, check out the Save the Children website next week for video interview from kids around the country that are knitting hats for babies. Three KCD middle schoolers will be featured on the site. I will post the link as soon as it is available. Today we took a field trip to the Kentucky Humane Society to deliver our donations and see the facility. We were able to donate about 20 handmade pet beds or blankets. Thanks to "Aunt Tessie" from New York for sending us the pet afghans! They will make such a difference! The beds and blankets in the cages help the animals feel less stressed and their calmer demeanor makes them more adoptable. Along with the beds, we also dropped off supplies of paper towels, peanut butter, and a variety of pet supplies. We were able to make a monetary donation of over $280, raised during our Dance Dance Revolution Tournament and a Dress Down for a Cause day. Thanks to everyone who helped us help the animals. Below are some pictures from our day. After we arrived, we listened to a brief presentation from the education director, Valerie Merrifield. We then toured the facility and interacted with the adult dogs and cats and kittens. Since the puppy room was closed for "deep cleaning," we were given the special treat of having a puppy to play with in the conference room and KHS t-shirts to take home. All in all, we had a wonderful time and felt good about our small contribution to this worthy cause. We first toured the adult dog area. We were given treats to feed the dogs and encouraged to ask them to "sit" first before rewarding them with the treat. Many of the dogs were very excited and eager to interact. Next we visited the cat area. We were allowed to take out and hold the kittens. This kitten's name was "Clueless." Cuddling the kittens... We had to use hand sanitizer before touching each animal to prevent the spread of germs between the animals. The adult cats were not allowed out of the cage, but we could open the doors and pet them if they acted interested. Back in the conference room we got to meet "Cody." He was a young 8 week old puppy. The students formed a tight circle so Cody couldn't "escape." He was allowed to run around the circle and be petted by whomever happened to be close. We had a great time at the Kentucky Humane Society and will continue to make projects to help the pets. The education director had a recipe for dog treats that we could have made, but we ran out of time and had to come back to school...darn! The Dance Dance Revolution Tournament was a big success and a lot of fun! Over 30 competitors came out to dance to help the Kentucky Humane Society. Qualifying Rounds were held after school on Tuesday, February 25th through Thursday, February 27th. Competitors entered in one of three levels: Beginner, Intermediate, or Expert. We used Dance Dance Revolution Superonova on all stations (we had three set up). Qualifiers could choose the song they wanted for their "official" score. Two "expert" players practice against each other in my classroom. Students completed their qualifying rounds after school. A few teachers got in on the fun! Some players did really well, even though they had never played DDR. On Friday, February 29th, the Finals Tournament was held in the Commons Room. The top eight qualifiers in each level competed in an elimination bracket that ended with just one winner! Song selection was set on "random," so students did not know what song they would get. The crowd cheered on their favorite dancers! In the Expert level, there were just three competitors, so they went first in a round robin schedule. In the first head-to-head round, our talented dancers amazingly received EXACTLY the same score. The tie game had to be decided by the number of "perfects" scored. The game was projected on a big screen on the stage. Lights were dim for a great atmosphere! With single elimination looming, competitors were intensely focused. Parents and teachers stayed to watch the fun. By the end of the competition, many people were really dancing up a sweat! Everyone did great and had a lot of fun. The three winners each won a $20 gift card to GameStop (video game store) and a ribbon. Over the course of the week, we raised $110 from entry fees and another $169 for a Dress Down day, for a total of about $280 for the Kentucky Humane Society! We'll be delivering that along with donations and pet beds on our field trip there next week. A lot of fun for a great cause!